Boat is located in Canyon Lake,Texas.Please contact the owner @ 512-938-three six four four or jwmathis12(at)satx(dot)rr(dot)com...MacGregor 26M, 2007 Name of Boat: HobNob Description: Boat is in excellent condition. This Boat is a water ballast boat. Towing and Launching it is a dream! With dagger board up only takes a mere 12" of water to float. It has all the basic features of the MacGregor 26M (rotating mast, steering wheel helm, twin rudders, enclosed head, forward and aft bunks, sliding galley, dinette, tons of storage, etc.). 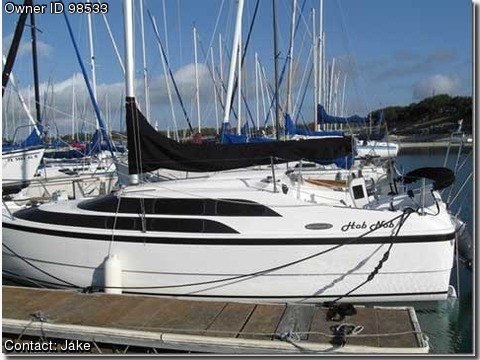 In addition it comes with the Mast Raising System, 100 Jib and 150 Genoa, GPS (W/ Speed, Depth Finder and Navigation Map chip for North America), two Batteries (HD Marine Engine Starting and AGM House Batteries) W/ Battery Switch, Swim Ladder, on deck Head Pump out connection, VHF Radio, Yamaha 60 HP FI Engine (recently serviced), Two 12 Gallon Gas Tanks, Engine Steering Disconnect (for no engine load on steering while sailing), LED lighting in Cabin and Top Side Navigation Lights, and Rear Mounted 80 Watt Solar Panel with regulator so youll never run out of power while anchored or just sailing. She comes with the latest version Aluminum Trailer with new tires and a mounted spare tire. Have reduced the price $1000 because she was recently just taken out of the water and needs some TLC, an annual waxing and bottom cleaned (very superficial). Location: Canyon Lake, Texas / Canyon Lake Yacht Club (LCYC).